The U.S. top diplomat reaffirmed America's commitment to a "free and open Indo-Pacific" region during his first trip to Vietnam, saying Washington and Hanoi will work together to uphold freedom of navigation and overflight in the South China Sea. 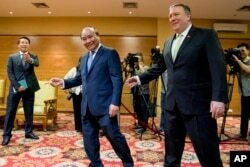 “The United States is dedicated to an Indo-Pacific region with strong, independent nations who respect each other’s sovereignty, uphold the rule of law, and advance responsible commerce,“ said Pompeo at a business community reception in Hanoi. “In contrast with others in the region,” added Pompeo, “the United States’ actions are not guided by "raw economic self-interest alone” Instead, Pompeo told the group the U.S. is working to build partnerships to deal with regional concerns over China’s militarization and reclamation of features in the disputed South China Sea. “Both sides welcomed cooperation to uphold the freedom of navigation and overflight, with Vietnamese leaders welcoming a strong U.S. role in ensuring stability in the South China Sea,” said State Department spokesperson Heather Nauert on Monday after Pompeo met with Vietnamese Prime Minister Nguyen Xuan Phuc. U.S. Secretary of State Mike Pompeo, right, meets with Vietnamese Prime Minister Nguyen Xuan Phuc at the International Convention Center in Hanoi, Vietnam, July 9, 2018. A map on Facebook’s advertising tool was found to have marked the disputed Spratly and Paracel Islands at part of China's territory, prompting the Vietnamese government to lodge a formal complaint. Facebook reportedly acknowledged the boundary marking was a technical mistake. Experts said Pompeo's visit to Vietnam sends an important signal that the two nations' are working together to help contain China’s aspirations in the South China Sea. “The challenge is that Team Trump’s Asia emphasis—as has been for the past year—is clearly focused on North Korea and trade issues with China with little attention left for anything else. This, of course, plays right into China’s hands,” said Harry Kazianis, director of defense studies at the Center for the National Interest in Washington. 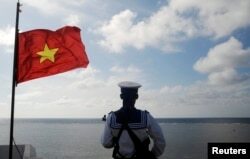 FILE - A Vietnamese naval soldier stands quard at Thuyen Chai island in the Spratly archipelago, Jan. 17, 2013. “The administration must make all of Asia’s problems and a more comprehensive grand strategy there its top priority, or Beijing will no doubt control and dominate the South China Sea and turn most of the region into one giant sphere of influence,” Kazianis told VOA on Monday.